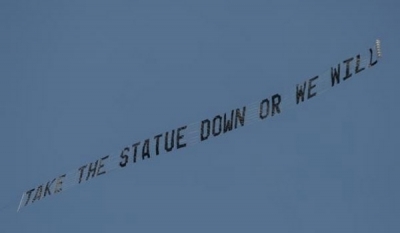 An airplane flew around State College today towing a sign that read, "TAKE THE STATUE DOWN OR WE WILL." The statue referred to in the sign is believed to be the bronze statue of the late former head football coach Joe Paterno that is standing outside Beaver Stadium on the campus of Penn State. Paterno's name has been tarnished in the wake of the Freeh report into the University's handling of allegations of sexual assault by former assistant coach Jerry Sandusky. The flying sign comes on the tails of the renaming of the student tent city outside the stadium from “Paternoville” to “Nittanyville”. The Ohio Ad company who flew the plane would not say who hired them to fly the message. 35-year-old Kareem Alleyne is out on $150,000 bail today after being charged with the death of an off-duty police officer late Sunday. Alleyne was charged with involuntary manslaughter and vehicular homicide after he allegedly drove his car into Officer Marc Brady who was riding his bicycle. Brady and Alleyne have a history. Alleyne's current girlfriend is the mother of six of Brady's nine children. Brady worked in North Philadelphia's 22nd District. A former head lacrosse coach from Lansdale Catholic High School, Tim Udinski, has been charged with stalking and harassment. He is accused of sending anonymous emails to the Archdiocese of Philadelphia containing false allegations of sexual abuse against other members of staff at the high school. The emails began after Udinski was fired from the school and lasted from Oct. 2011 to May 2012. Udinski would claim in the emails that the Lansdale Catholic lacrosse and football coaches were making sexual solicitations towards players on their team. After county detectives investigated these allegations and found them unfounded, they eventually traced them to Udinski. His reason for making the false claims, he said, "I was mad at the school for the way I was treated. I was just furious." Tonight, Very Warm, Temperatures slow to cool off into the 80's this evening with clear skies in Philadelphia.